Oops - yoghurt or cream will ease the pain - or drink a glass of milk! Been there, done that! Well I did say that I am a 'cook by eye/taste person! I use fresh chilli - 1 depending on rating - per recipe so maybe your 'cap' was a little on the large side! Last time I made this I used 1 birds eye chilli to one butternut squash and it was pleasantly heatful! Dried can be more powerful than fresh! I think you eventually adapt too, Soapy. I use more chilli now than I used to - I think it tastes mild but DD and OH said er it has quite a kick! Oops - all the more for me then! We've made 3 Ottolenghi recipes this week. 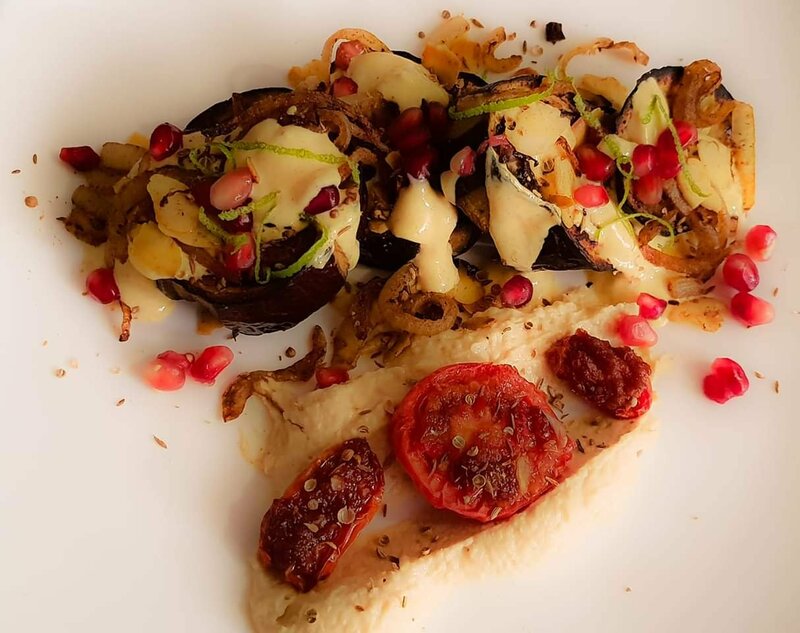 Aubergine with yoghurt curry sauce, with a side of houmous and slow cooked tomatoes with a caramelised ginger and chilli topping. Baked potatoes with gorgozola and spinach. We used St Agur, because that's what we had in. All were from his SIMPLE book and yummy, OH particularly liked the aubergine. Looks yum. Today OH made lemon curd. With our own eggs! Would like to say with our own lemons but 'fraid not! As I type OH has his annual batch of marmalade on the go (or should that actually be dadalade as OH is making?) YS and I are up for a batch of ginger biscuits this afternoon and I need to make more parkin to stash away as we'll start on the fruit cake from 3 weeks ago later. I do like it when the kitchen is full of a baking fug! That looks yummy RHC, I do love aubergines. I do a lot of veggie recipes much to my OH disgust. I have just made limoncello cake, after finding a bottle of the stuff we brought back from holiday 2 years ago. Just wIting to slice it. I get all my recipes online and this was one of those cup ones. I much prefer grams, I always think end product is not right and blame my conversions. Yep, I am not keen on recipes with cup sizes (!) either, I try to remember to put 'uk' in my recipe search terms but it doesn't always work. We have received 2 jars of my favourite homemade marmalade from our neighbour. Henceforth it shall be known as grandadalade! And in the weird way of coincidences we have also sampled some delicious homemade ginger biscuits this week as well, made by a different neighbour. Apparently she ran out of ginger and so raided the fridge. The results were made of a combination of powdered ginger, stem ginger, crystallised ginger, so far so normal, and also sushi ginger which had to be washed to get rid of the salt/vinegar! I had a bit of a culinary disaster recently (actually I caught it in time but did feel stupid!) We make our own bread and I make breadcrumbs from any odds and ends. Useful to have in the freezer for stuffings, chicken coating etc. I also put lots of odd bits of leftovers in the freezer too. I bought some cod from Lidl (very good value it is too!) and decided to make my own fish fingers. I egged the fish slices then dipped them into the breadcrumbs and it was only when I noticed a few sesame seeds in the 'bread crumbs' that I realised I'd just coated the fish fingers in crumble mix. Luckily I was able to wash the crumble mix off and start again. I don't usually wear my glasses around the house but I'm going to have to now! Either that or label things properly before I stash them away rather than relying on an obviously failing memory. I prefer my imperial scales but happy to use cups as I bought some a while ago because I was looking at US recipes. Love the smell of baking. We've had maple cured bacon recently and that is such a yummy smell when it's cooking! The lemon curd was quite runny yesterday, had it for lunch! Today we had it for tea and it's thickened nicely - it's such a deep yellow colour! I've also made custard from our own eggs - just as easy as opening a tin of Bird's but oh so much better! Later on OH will make hollandaise sauce in asparagus season. I've yet to make mayonnaise, but I will have a bash if he doesn't race me to it! OH has his digital scales - he isn't allowed to keep them in the kitchen! But my Salter scales were given to me as a wedding present from my bank branch (lovely group of generous people) so they are on the counter. I polish up the brass now and again and it looks so nice. Although I never use it to exact measurements, just a rough idea. My grandmother just used a tablespoon to measure things and she was a terrific cook! when I was a child and learning to bake with my mother I used to measure (exactly) by eye very often. (I'd cut butter/cheese or measure flour/sugar by spooning it on to the scales, and it would be exact!) My mum used to say "you'll never get married". Apparently it was a saying/old wives tale. I was taught to bake by my Nan. Everything was measured in tablespoons. Except for butter etc which was weighed on imperial scales. I still use imperial scales with the brass weights. I showed them to the grandchildren and had them weighing flour etc for pancakes. They were fascinated by the brass weights. I don’t think you can teach the concept as well with electronic digital scales. I always make my own rolls for my husband's lunch box. I love weighing the dough by hand to make 12 rolls. I love balancing them to make 12 equal rolls. When I was a little girl my dad was a baker and we lived above the bakery. I remember watching him in the early hours make what seemed like hundreds of rolls, really, really fast. It's a very strong memory, when I think about it I can smell the flour and yeast. Redhotty - OH measures to the grain/dust to be exact - I'm contemplating him not being married if he keeps that up! Drives me crazy that he is so precise. My dad made the best pancakes (my mum - ugh horrid pancakes and batter puddings - batter rubber frisbys) he just tipped the flour into a bowl, added an egg or two in the middle and gradually added milk. He always used a fork to whisk it all in and there were never any lumps! Still don't know how he managed that - but the cat loved his pancakes too - had to fight her off for my portion! Patricia - my mum was the worst cook ever! She's better now though. Just had to check fox in the garden outside the window!!!! 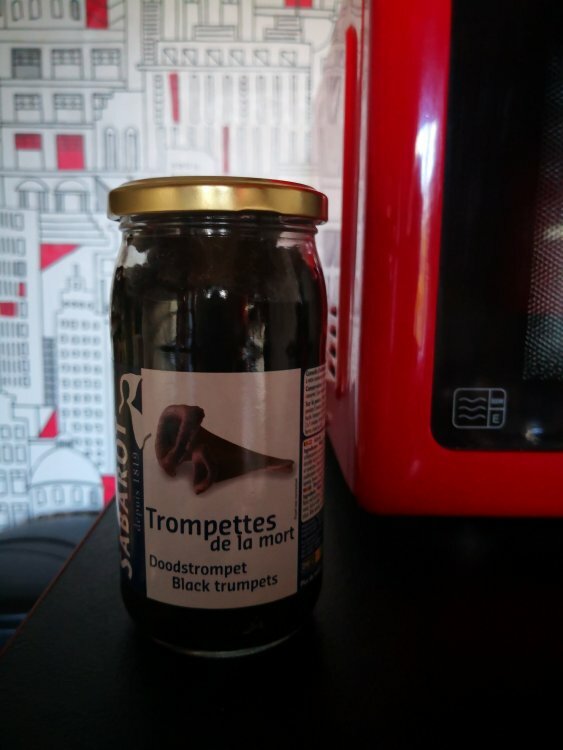 I couldn't resist these... Trumpets of the Death!? I think they might be chanterelles but even so I haven't got a clue how best to use them. Any suggestions? The perfect present for someone who has everything, PL!!!! Val......my OH makes batter 'by eye'. Works....most of the time! Now I've started doing it that way too, keeping in mind the adage that it should be the consistency of thick cream! I beat it like mad with a balloon whisk then leave to stand for an hour before using...no idea why but all the books/recipes tell you to so I do! They aren't chanterelles PL, although they do look like black versions of one, but they are very tasty and they also grow in the UK, I don't know if we have an English name for them, I don't think so, one year we picked so many I am slightly embarrassed to remember it! Just soak them to plump them up and then use them in any recipe that calls for dried mushrooms like risotto to flavour the stock, in an omelette, in a forestiere sauce (basically mushroom sauce) to go over any meat/game you fancy, I guess you could make soup out of them or put them in for extra flavour in a veggie soup, put them into a mushroom sauce over rice or a strogonoff or er I have run out of ideas! trumpets of death! Do you play them? Had to look them up - horns of plenty! Supposed to be really nice. So are a lot of things but depends on your taste. Try it and see.